With Crystal not having taken delivery of a new ship for twelve years, Hapag-Lloyd having bedded in its STX-built 2013 vintage Europa 2 and Fincantieri completing the last of Ponant’s four 264-berth luxury cruisers as well as preparing to deliver the new Viking Star this spring, it appears that the Italian shipbuilder now dominates the market for ultra-luxury cruise ships. With Regent’s latest ship on the way for delivery in 2016, two new 604-berth ships for Seabourn and a potential new order from Silversea for three ships of similar size, Fincantieri has this market wrapped up for now. Today, we examine this situation in a little more detail. 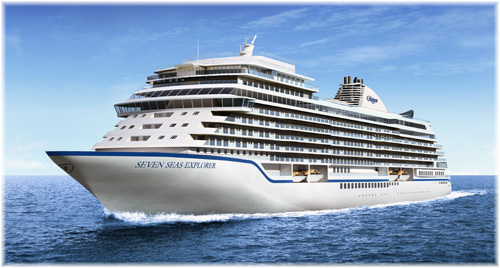 Bookings have now opened for the 54,000-ton 738-berth Seven Seas Explorer, Regent Seven Seas’ latest and largest ship, which is due to enter service in mid-2016. The vessel will boast all-suite, all-balcony accommodation, with suites ranging from 300 to 1,500 square feet in size, fitted with comfortable furnishings and designed in a tasteful and attractive manner. The larger size of the ship, combined with the limited quantity of accommodations, will allow guests more space and privacy. In addition to the all-suite accommodation, guests will be able to enjoy a range of features, including a two-storey theatre, three on-board shopping boutiques, a nine-deck high atrium and spa by Canyon Ranch, as well as numerous other facilities. What is interesting here is that while the new Regent ship begins to approach the Europa 2 in terms of space measured in gross tons per passenger, the Seabourn Encore comes out at about 6% less than the Seabourn Odyssey class they follow. What is noteable is that with the exeption of the Europa 2, which has recently been purchased by Hapag-Lloyd Cruises parent the TUI Group, all these ships have been or will be built by Fincantieri. Ultra-luxury small ship cruise line Seabourn last week unveiled the names for the two new ships it has ordered from Fincantieri. The Seabourn Encore, which will debut in late 2016, and Seabourn Ovation, to follow in the spring of 2018, will be based on, but much larger than, the 32,000-ton 450-berth Seabourn Odyssey trio, completed by Mariotti in 2009-2011. While Seabourn Encore and Seabourn Ovation will maintain the line’s high ratio of space per guest at 66.8 tons per guest this will actually be about a 6% reduction from the 71.1 tons per guest achieved on the Seabourn Odyssey class, but more than 40% more space per guest that the original Seabourn Pride trio. With the addition of the two new ships and the sale of the original trio, Seabourn will have the youngest and most modern ultra-luxury fleet in the industry. 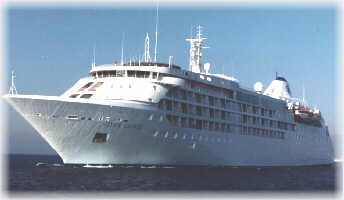 The new pair is similar in many ways to Silversea’s 36,009-ton 540-berth Silver Spirit, completed by Fincantieri in 2009. They will feature an extra deck compared to the Odyssey trio, newly expanded public areas, and innovations consistent with Seabourn’s reputation for understated elegance. The new vessels are expected to carry 604 guests each, based on double occupancy, and every suite will feature a private veranda. Designer Adam D Tihany has been appointed to design both ships in their entirety, drawing inspiration from what has gone before. He will design all indoor and outdoor guest areas, including the multiple dining venues, the spa, showrooms, casino and lounges, outdoor deck areas and the popular Seabourn Square, social hub of the ship with a club-like ambiance. 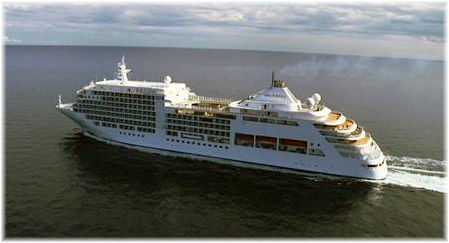 Seabourn offers key elements that set the cruise line apart: all-suite accommodations, most with verandas; superb dining in a choice of venues; complimentary open bars throughout the ship; complimentary fine wines at lunch and dinner; award-winning service and a relaxed, sociable on board atmosphere that makes guests feel right at home. With last year’s reports that it had arranged €800 million in financing from China’s ICBC Leasing, speculation is rife that Finacantieri are about to pick up an even larger order from Silversea Cruises. This will be for three ships, in all likelihood larger developments of the Fincantieri-built Silver Shadow of 2009. Following in Seabourn’s steps, they could indeed be capable of carrying more than 600 passengers each, or more than double the size of Silversea’s original 296-berth Silver Cloud and Silver Wind, which date back to 1994 and 1995 and are now exceeding twenty years in age. The new ships are bound to be more fuel-efficient than Silversea’s present fleet but one of the more interesting points is what will Silversea do with its older units in order that they not compete with them. Seabourn seem to think they have found a solution by selling the three original Seabourn class ships to former affiliate Windstar, which is also based in Seattle. Just last month, perhaps in an effort to differentiate itself from Seabourn, Silversea announced that it would begin to include shore excursions and internet into its product pricing for the Mediterranean this summer. That this is an experiment, and probably a strategic one at that in order to attract more Americans to Europe, is indicated in its decision to restrict the extras to new bookings only. We await with interest Silversea’s new ship announcement when it occurs. In previous announcements, the line has said that it has a classic ship on the drawing board, but that it takes three years to build one.